Molle adapter attaches to our paddle retention holsters and mag pouches as a direct raplacement of the paddle using the same attachment screw. Attaches to tactical vests and other molle type tactical wear. 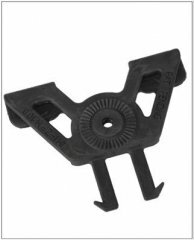 Single injection molding creates a more durable, one-piece accessory. High-tech, black polymer, one-piece design features no rivets or weak points. Rotates 360 degrees for every application. Securely attaches to most tactical wear.